I keep getting told off for talking about Christmas, even though everyone knows that November means Christmas. Apparently it’s too early to be buying my pet rats Christmas presents? Or perhaps I shouldn’t be buying my pets presents at all? What do you mean rats don’t celebrate Christmas? Anyway, to avoid being told off any more, I’m putting Christmas on hold for a short while and just going back to winter. Winter is pretty rubbish, but it does mean you can eat plenty of comfort food and just chalk it up to the weather. And what’s more comforting than gooey, melty cheese? Welsh rarebit / Welsh rabbit actually has nothing to do with rabbits; it’s a traditional Welsh dish that’s basically a fancy version of cheese on toast. 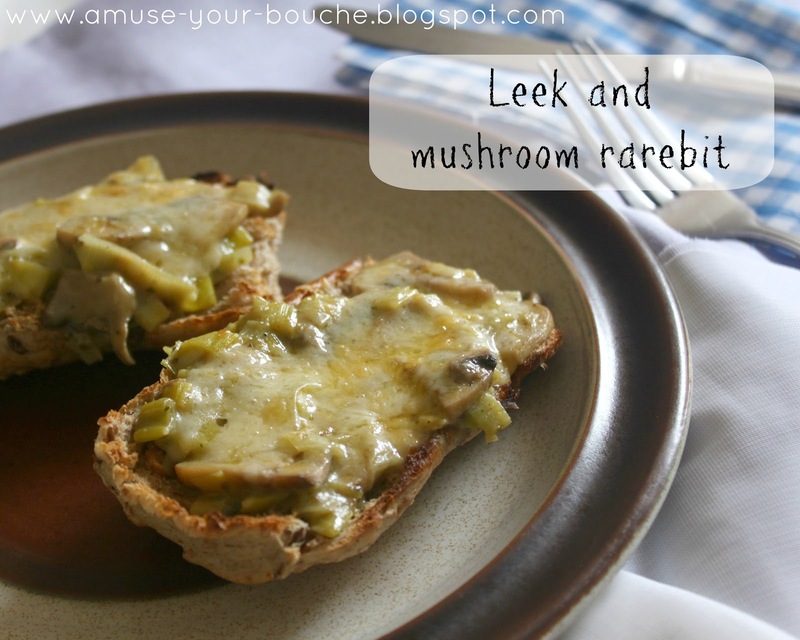 My version uses leeks (one of Wales’ national emblems) and mushrooms to give it a bit more substance, and to make it feel ever so slightly less indulgent. Served on a piece of rustic granary bread, I felt like I should be sat in a Welsh farmhouse looking out across the valley. The addition of some dried herbs and mustard (albeit an entirely untraditional type of mustard) makes this quick lunch recipe burst with flavour. 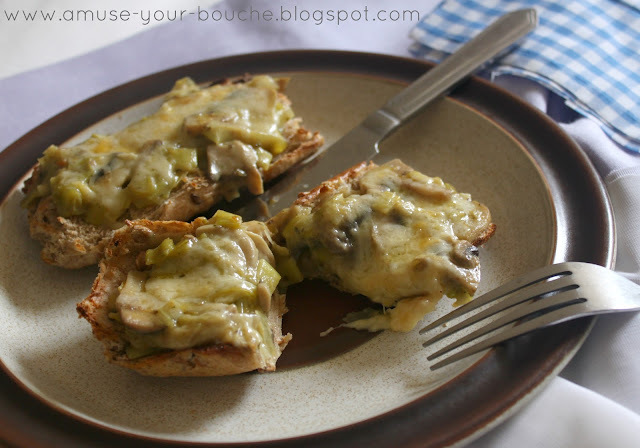 I often find plain cheese on toast difficult to finish, because it can be a bit rubbery and a bit greasy, but this spruced up version was far more enjoyable. 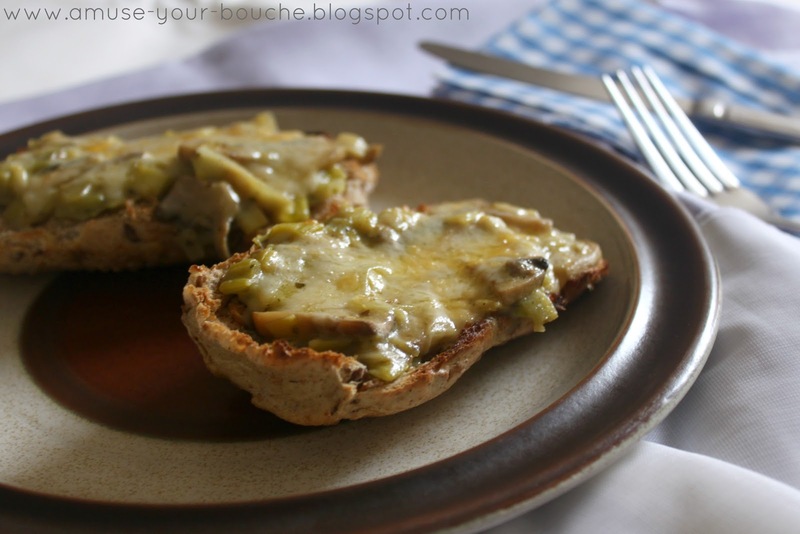 If you like warm, gooey, cheesy sandwiches you might also want to check out my garlic mushroom melts, my brie, honey and basil melts, and my cheese melts with caramelised onions. I guess it turns out I really like melting cheese. Heat the oil in a saucepan and cook the leek, mushroom and garlic over a medium-low heat for 5-10 minutes, until the leek is soft. Crumble over the vegetable stock cube and add the herbs and mustard, along with a splash of hot water. Continue to cook for a further 5 minutes, stirring regularly. The mixture should be wet, but without too much excess liquid. Add about three quarters of the cheese, and mix well over a low heat until the cheese has melted. Lightly toast the 4 pieces of bread, and top with the cheese mixture and the remaining cheese (you only need a little on top). Place under the grill (broiler) for a few minutes, until the cheese has melted and the edges of the bread are crispy. Ignoran American question: are leeks really common there? Because seriously, nearly every person here whom I’ve told that I’ve had leeks for dinner has asked me what they are. Are leeks common where, in the UK? Yeah! They’re one of the national emblems of Wales :) and very common in the supermarkets. I thought they were available in the US too though…? Oh yes, they’re available here, just most people never notice them because they don’t use them. I’d never bought one before this year myself…they’re just not at all popular.